Suncast's Sidewinder hose reel provides convenient, wall mounted storage for your garden hose. Sturdy resin construction makes it durable and easy to maintain. Leader hose included. 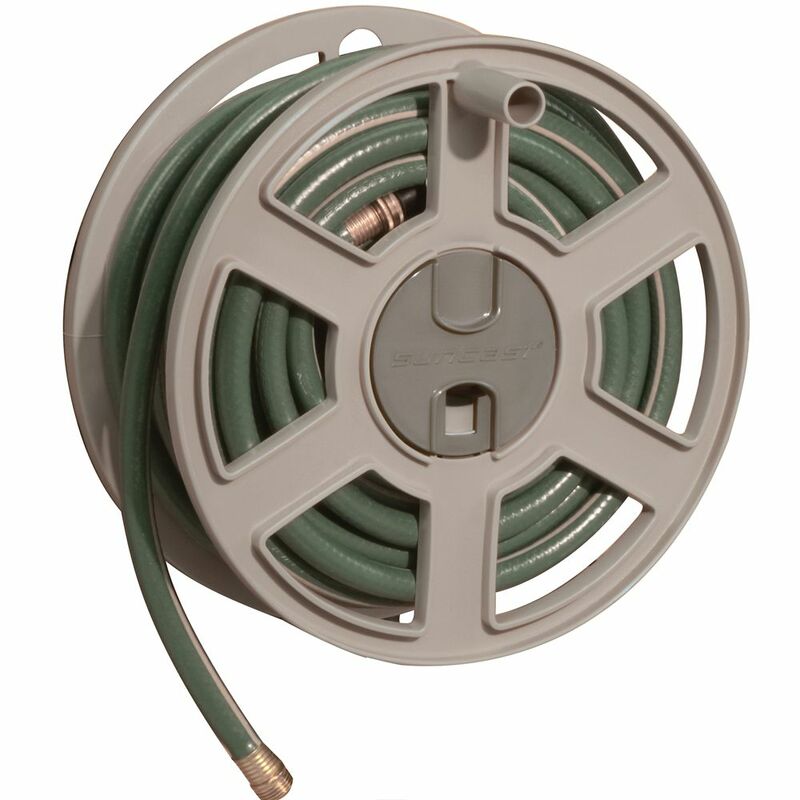 Hose capacity - 100' of 5/8"
SideWinder Wall Mount Hose Reel with 100 ft. Capacity Suncast's Sidewinder hose reel provides convenient, wall mounted storage for your garden hose. Sturdy resin construction makes it durable and easy to maintain. Leader hose included. SideWinder Wall Mount Hose Reel with 100 ft. Capacity is rated 3.3 out of 5 by 7. Rated 1 out of 5 by Ranjit from Leaking issue This hose reel was leaking . I totally waisted my time. This could be manufacturing issue or only this hose reel. I did not bothered to buy the same one again. Rated 3 out of 5 by Doug from Works well with modification. This hose winder replaced the same product of 20 some years previous. However the new reel does not come with a hose guide so it is not multi directional as was the original. With a couple of cuts with a hack saw I removed the old guide and mounted it below the new reel and it works as the original. The feeder hose to the reel atachement is improved. Rated 5 out of 5 by Capilano Lass from This is my 2nd one. I had one previously and it lasted for over 20 years so I just bought the same one again. Very happy with this brand, This style suits my particular location, in other words I unroll it from the side and not the front. I have a very long hose on it and it handles the weight with ease. Rated 1 out of 5 by cb973 from Leaks and central shaft fell apart after one month Bought two of the same reel for different locations with new hoses. Both leaked from the start and after about one month the central shaft on one broke and can't be reassembed. The whole reel is held on by four tiny catches that break easily. We were not rough with it and had only used it a few times. Very poor quality construction. Rated 5 out of 5 by Jan1949 from Great product and quick delivery. I replaced my old wall mount hose reel. Installation was easy. It works very well. Rated 3 out of 5 by Lisa from Looks nice! Bought this because it is supposed to hold 100' of hose, we have 75' of hose on it and it's hardly big enough for that! My sidewinder wall mount hose reel leaks from the hose-connection inside the drum. I probably need a new O -ring. Do you have those or could this be another problem?